Objective: Nurture relationships with existing customers, spark social engagements and generate brand advocacy. Insight: According to Nielsen people place a high degree of trust in consumer opinions posted online and are big fans of real life situations. In addition, iClothing's demographic are mad for selfies. Approach: We created the #IWEAR campaign, in which we encouraged iClothing customers to post a selfie of them in their new threads to their social media channels using the #IWEAR hashtag. We offered small prizes as an incentive. We then recycled the images posted by users, with permission, into marketing materials for the #IWEAR campaign. 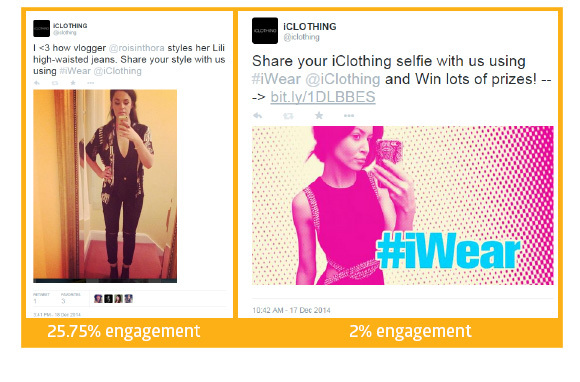 Results: The campaign generated a whopping 127k engagements with the #IWEAR hashtag. Twitter followers doubled inside of the first 4 weeks. What was suprising was the UGC images taken by girls in their bedrooms and bathrooms enjoyed engagement rates 10x of those of the usual stylised images of models! During the first 4 weeks of the campaign website visits from repeat customers increased by 10%. Iteration: Bowled over by the success of this User Generated Content (UGC) campaign for generating engagement and brand advocacy, we decided to create a similar UGC campaign targeting the other end of the purchase funnel. #IWANT was born. We encouraged people to upload pictures of clothes they wanted using the #IWANT hashtag, and iClothing would respond via social media with similar items availabel to purchase online.